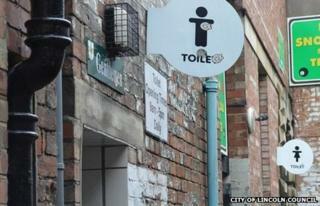 A council could close some public toilets in Lincoln following concerns they are being used for sexual activity. The City of Lincoln Council said the "problematic" St Peter at Arches toilets were not being used "for their intended purpose". One local business said people were scared to use the toilets because of men meeting there for "cottaging". A consultation on closing the toilets ended on Friday. A man working nearby told the BBC: "Honestly, the best thing they can do is they should close the toilets. "A lot of people get scared to use the toilets because they don't feel safe. "A lot of people come in and ask to use my toilets." Only the men's toilets were being misused, according to a council report. However, the misuse is said to be deterring women from using the toilets too. Their location, "along an uninviting long and narrow passageway", is also said to be a problem. The council would save about £3,200 a year if it closed the toilets. It has alternative toilets people can use if they are closed.